Just after the news that Microsoft was about to buy it, Nokia let a curious little gadget drop: a Nokia phone running Android. 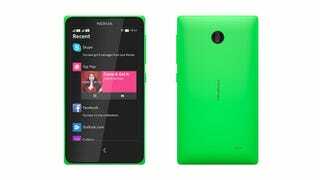 And the Nokia X wasn't just a one-off curiosity; it even has a successor. But that's the end of the line. Microsoft CEO Satya Nadella says no more Android for Nokia. It should come as no surprise. Microsoft now officially owns Nokia, and as Nadella says in his recent announcement, the teams are being absorbed into Microsoft. That involves promoting the Nokia X product line to full-fledged Lumia status, but they have to drop the Android and move to Windows Phone. And considering that Microsoft just made moves to block Google as a default search on new Lumias, it probably wouldn't want to run Google's operating system either. It's a damn shame too, because as strange as the Nokia X was, it teased a strange but interesting new world where Microsoft might just push its services, taking the barebones of Google's operating system and slathering it in offerings of Skydrive and Outlook and Bing while still being able to offer compatibility for the full suite of Android apps. Combined with Nokia's awesome hardware, it made for a weirdly compelling Frankenstien of a device.